The Sunday Salon – November Books Recap [12.4.11] – my books. my life. It’s hard to believe but December is here and it’s time to recap November (and soon 2011 – yikes!). Considering how little time I had to spend reading (due to a busy schedule and feeling pretty awful), I was pleasantly surprised to see I finished 5 books in November. Not only that, but I reviewed every print book I finished. I am definitely not on par to hit 100 for the year anymore (which really wasn’t ever my actual goal anyway) but there is always next year. 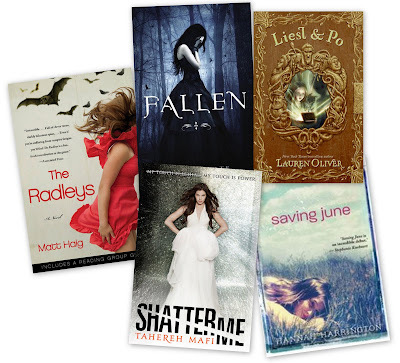 November Favorite: Saving June (but many of these were really very good). What was yours? Now I am off to do a million things, which includes decorating for Christmas (yay!). Have a wonderful Sunday. I should start doing a monthly recap. I don’t pay much attention to what I’ve read in a particular month (though do keep tabs on a yearly numerical goal) and liked best. I think it might be fun to keep a closer eye on that in the coming year. I started Liesl and Po but turned it back into the library because I got distracted by soemthing else. I really do like Lauren Oliver though! I think my favorite books reviewed in November were Ready Player One (audio) and Night Strangers (print). My dad is out of town so we still don’t have our Christmas tree, I think we’ll need to wait until mid-week. I love getting the tree and decorating! I become a little kid again, which is so much fun even though I am in my 40s! I also really liked Ready Player One, and also Unbroken for this month, but there has been a distinguished lack of good reads over the past few months for me, and it’s made me sad :(. I am hoping that I can get some great reads in before the end of the year, and that I can plump up my best of list, because it’s pretty skimpy right now! Wow the paperback cover of The Radleys is really interesting. I really want to read Shatter Me – I have heard so much talk about it!